Search French holiday parks (or holiday parcs) offering static caravan hire, holiday chalets & lodges in the various regions of France. Holiday parcs are a superb way of enjoying the French outdoors, park life and fantastic countryside with all the mod cons of home. You will find 408 holiday parks in France with static caravans, park homes and lodges to rent. The French have a wide variety of parcs on offer all over the country. If you know the area of France you wish go to just use the area menu to the left. With 408 lodges, cabins and caravans to choose from you will be spoiled for choice. There are quiet holiday parks in France, small parks with a few facilities to bigger holiday parks offering a wide range of activities and something for the whole family. To search for a French holiday parc just use the map to click on the region you are interested in or alternatively you can use these region links. Here are just a small selection of the French parks on offer. La Ravoire is located in the Rhone Alpes area of France. Small and peaceful, La Ravoire offers a superb natural setting with lots to see and do close by. An ideal base from which to discover this beautiful area. La Ravoire is a lovely little parc with genuine charm and excellent facilities. 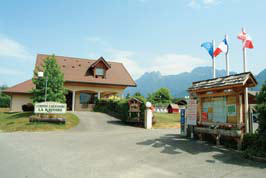 View holiday parks in the Rhone Alpes area. L'Ardechois is located in the Rhone Alpes area of France. L'Ardechois offers not just stunning facilities, but a superb natural location on the banks of the Ardeche itself. 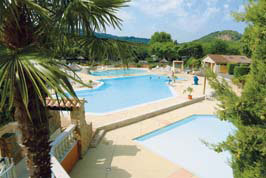 L'Ardechois is a superbly well-equipped parc situated alongside one of the loveliest stretches of the Ardeche river. Le Ruisseau is located in the Aquitaine area of France. With the beaches of Biarritz and the walking of the Pyrenees to discover, this is always a popular choice. As well as its fantastic location, this parc offers a wide range of facilities, making it popular with young and old alike. 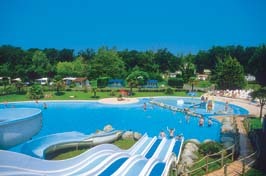 View holiday parks in the Aquitaine area. Le Mane Guernehue is located in the Brittany area of France. Le Mane Guernehue is a superb family-run park located at the top of a steep hill and comes complete with excellent facilities and easy access to many of Brittany's lovely sandy beaches. 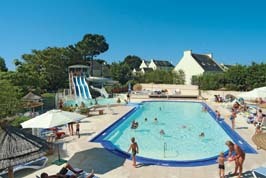 View holiday parks in the Brittany area. Raguenes-Plage is located in the Brittany area of France. While there are plenty of activities on this quiet parc, there are also many wonderful walks just beyond it. It's little wonder that Raguenes is so popular with families, bringing many people back year after year.